Maravot's Home Page; a place for scholars – maybe also a place for the weary to rest. These books involve in good part a conversation with Wm. F. Buckley Jr. which lasted about 2 1/2 years through monthly correspondence from December 1992 through May 1995. Books relating to that conversation are marked with a .
Maravot's work in deciphering the Etruscan Language. This work was originally published in 1981 as the "Catalog of Etruscan Words," by Mel Copeland. The work now integrates the Tavola Cortonensis and Zagreb Mummy scripts, which are the most recent finds. The work shows Etruscan conjugation and declension patterns. The first page lists the words and is an easy reference as to where they can be found and where their declension and conjugation patterns may be compared and examined. Translation of the various scripts is nearly complete. The work extends to not only translating the Etruscan scripts but also new areas of study in the development of the Indo-European languages. Tables are furnished showing the relationship of hundreds of Etruscan cognates to the basic Indo-European language groups. Banquet of the Gods, research on the similarities of Etruscan works to the Greek Illiad, the Celtic Tain, Anglo-Saxon Boewulf, the Rig Veda and the Indus Valley seals (Harappa civilization). We are reminded that the wonderful murals in the Etruscan tombs have a story, and no doubt those who commissioned the murals had no intentions to have anyone from the world of the living judging them. It is a good primer for those interested in the role sacrifice played within the Indo-European religions. Hittite & Mitanni Texts and documents, Ancient Hittite and Mitanni documents as they relate to the Rig Veda and Etruscan works. To examine a map of Israel showing: 1) the Kingdom of David 2) Palestine at the time of Christ and 3) the UN Map of Israel from UN Resolution 11/29/47, click here: Mel's_Map_Israel.html. Click here for a 17th century Woodcut of Jerusalem showing a comet over Jerusalem, attributed to Josephus, "The Jewish Wars." 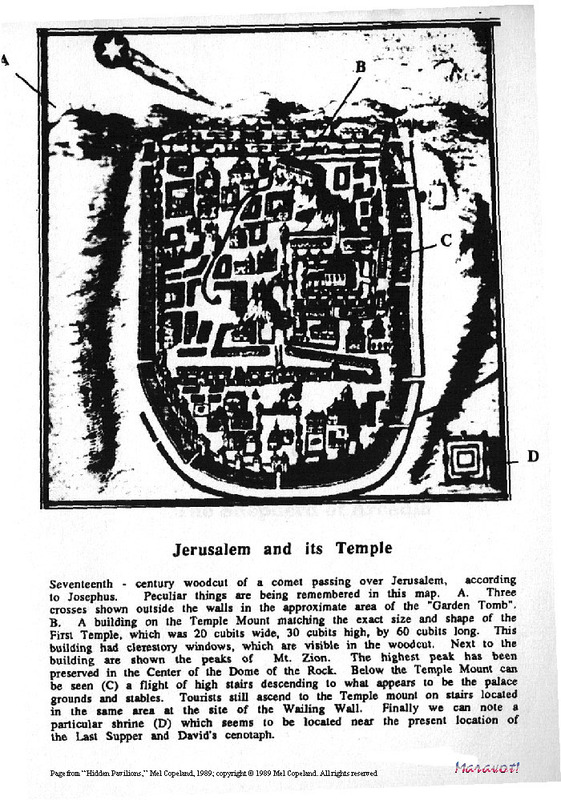 To examine a map of Judah which shows a curious tent-like structure, click here, Old_Map_Judah.html. This map, if opened first,will allow you to examine the other maps below using a split panel listing towns of the Copper Scroll treasure. To examine some maps relating to the Copper Scroll (Treasures amounting to about 300,000 pounds of silver) of the Dead Sea Scrolls, click here, Treasures_Copper_Scroll.html. To examine a map showing the possibility of there being a 12th cave yet to be discovered relating to the Dead Sea Scrolls, click here, The_Twelfth_Cave.html, only 2 pp. To examine more ancient maps relating to the vicinity of the Copper Scroll treasure locations, click here, Ancient_maps_Israel.html. Magnets in Space, a pdf file: discussion on Galaxy Group Hickson 44. A large galaxy appears to be causing a smaller galaxy on its same plane to flip over, just as in the behavior of magnets. When two wafer-type magnets are scooted towards one another with like poles (positive or negative) facing, one or the other of the magnets will flip over. Like poles repel, unlike attract. Romance_of_Anais.html, the Princess of the Holy Grail, Anaïs la fille du Roi, in English. 165 pp. in 12 Chapters. This work originally published in July 1992 strangely forecasted the outrages of the George W. Bush administration. Ouvrez [Click] ici à examiner La_Romance_ Anais.html, la Princesse Sang Graal, 159 pp., 12 Chapitres. This was written using a language translation program and admittedly needs work. The_National_Debt_Scandal, Maravot's_Homepage_4.html, only 14 pp. The Lord of Beasts.html, What George W. Bush would look like with a mustache. A documentary on the 2004 election. Maravot's The Allah Controversy, about 50 pages, a discussion on the many misunderstandings among scholars on the Koran: Since it was dictated by the angels of the Bible and written to confirm the Jewish Scriptures, Torah and Gospel (sic. the Bible), it cannot contradict the Bible. Moslem scholars suggest that Allah is not the God of the Bible, and that the Koran supercedes the Bible, ideas that are contradictory to the message of the Bible. Islamist extremists use the Koran's scriptures to justify murdering non-Moslems, and the applicable verses of the Koran that advocate violence against "unbelievers" are also inconsistent with the Bible / Gospel. Maravot's The Tabernacle of Moses, about 15 pages, a discussion on the unusual design of the device and its possible electrical properties as a capacitor. Maravot's Revelation_on_Faith.html ..of Prophets and the nature of their faith, only 5 pp. Maravot's Alma.html, on the controversy over the Virgin mentioned in Isaiah 7.14-24. Maravot's Grace_and_Truth.html, as pertaining to the opening statement in the Gospel of John that Moses gave the Law but Grace and Truth came by Jesus Christ; how can we verify that this is true? (work is in progress). Maravot's Son of Man, exploring the precept of the Messiah. Maravot's Synoptic Matrix.pdf a comparison of the Synoptic Gospels: Matthew, Mark and Luke, plus the Gospel of John laid beside them where they coincide. A great teaching and learning tool. The matrix is unusual as it recites passages which are different-- where passages are identical the chapter and verse is [only] listed. It is a quick way to discern the differences among the Gospels. It also flags the brilliance and wonderful singleness of mind and consistency of spirit Jesus had. The matrix takes up about 11 segments; some alignment problems may prevail until I get it all loaded. Matthew 16.26-20.1 and related gospel verses: Maravot's_Synoptic_Matrix5.html. Matthew 27.12-27.40 (scourging and crucifixion of Christ), Maravot's_Synoptic_Matrix9.html. Matthew 27.40-28.8 (burial and resurrection of Christ), Maravot's_Synoptic_Matrix10.html. Matthew 28.9/Mark 16.12 ff. (resurrection stories after the cross), Maravot's_Synoptic_Matrix11.html. From_Dust_and_Ashes_to_Joy.html, 67 pp. by Mel West (containing views of the Second Coming relative to Jewish tradition believed at the time of Jesus; and arguments (on choosing good and rejecting evil), from Xenophon, St. Theodoros the Great Ascetic, St. Maximos the Confessor, etc. Maravot's_Homepage_2.html, Secrets hidden for thousands of years click here, On Saving the Pope.. only 18 pp. Some of this may be hard to face for those who are effected by the light discussing the sources of anti-Semit ism. Maravot's_Homepage_3.html, the origins of anti-Semitism, only 21 pp. The Acceptable_Day_of_the_Lord.html, (includes quotes from St. Maximos and 100 teachings from Greek Orthodox fathers, 65 pp. The Repentance.html, only 15 pp. The Sword of Truth, only 60 pp. The_Tapestry_of_One.html, 166 pp. by Mel West, in five sections, concerning the teachings of the Brahmins, Lao Tzu, Buddha, Confucius, etc. The_Tapestry_of_One2.html, teachings from the Bhagavad-Gita. The_Tapestry_of_One3.html, teachings including the Upanishads. The_Tapestry_of_One4.html, teachings on the two vehicles of Buddhism. The_Tapestry_of_One5.html, continued discussion on the Greater Vehicle of Buddhism and an argument for understanding one another to achieve Unity. Maravot's_Poetry_for_People.html. (A peek into my soul) with a link into the PoetryRing. Ouvrez [Click] ici a examiner la Fraude Affreuse sur la dette Nationale des ´Etats-Unis; La_Fraude_Nationale.html, seulement14 pp. The United States Code - the complete set of Federal Law of the United States. The site has a search engine. Federal Government Web Sites - a collection of links to Congress and the Federal Bureaucracy. House of Representatives page' includes Great government links! Catacombe Roma — Great Roman catacombs site with graphics and documents; you will be overwhelmed! Catholic Saint's page and Catholic On Line; great site. Copyright © 1964-2019 Maravot. All rights reserved. Copyright © 1964-2019 Mel Copeland. All rights reserved.